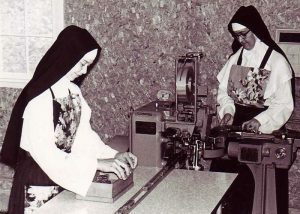 In 1955 Sisters began to consider replacing their bread making industry with something more conformable to the monastic life style. 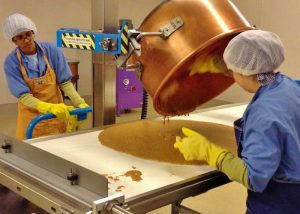 Through our Brothers at St Joseph’s Abbey at Spencer they got in touch with John Crand – a Greek candy maker, who was helping the monks to resolve a jelly problem. Having come to America in 1912, he developed his own candy business and opened a shop – Crand’s Candy Castle in Enfield, CT.
Mr Crand generously offered to teach the Sisters how to make candy and even shared some of his own recipes. He also made a donation of some of his own supplies. His sons came to help teach the Sisters too, and then his wife and daughters also started coming. The Crands became like a family, attending Sisters’ profession ceremonies and sharing joys of the growing community. The preparations for a new industry began in early 1956, with purchase of necessary equipment and ingredients. Mr. Crand insisted on very high quality standards – top of the line ingredients (regardless of cost), and no preservatives. We are happy to say that we have maintained this policy until this very day. On February 9th 1956, in the basement of our monastery, took place the birth of the new and exciting industry. 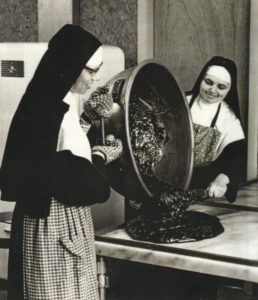 Sister Damian, together with Sr Edmund as her assistant, was appointed to learn the art of caramel making. Mr. Crand brought no written formula or procedure and all was conveyed verbally. After a long day, finishing around 8 PM that night, the first batch of vanilla-nut caramel was ready to be cut the following day, on the Feast of St Scholastica – February 10th, 1956. The whole Community was very cooperative in… sampling the new product for dessert, and it met with a wholehearted approval. Mr. Crand continued to come weekly to show the Sisters the secrets to his other flavors of caramels: vanilla, chocolate, chocolate-nut and licorice. After about 3 or 4 month he taught them how to make fudge and penuche. Once they were on their own, his professional assistance wasn’t required to the same extent, but he remained a friend and available to the community. Mr. Crand died in 1966. Sisters continued to develop the candy industry, increasing production and adding more equipment. 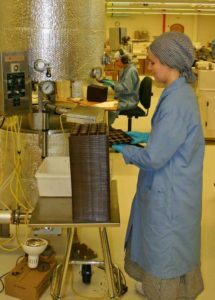 They also started to experiment with chocolate (self-taught, without any professional help), and so new products like stars and chocolate covered caramels were created. At first candy was sold mainly at the monastery, with help of some of the distributors Spencer had for their jellies. Later mail order was developed, and it became the main source of our sales. In 1957 Butternut munch was born, through a recipe passed on to us from a friend of our monks. Over time the original recipe was slightly altered and improved, and very soon it became our bestseller (and still continues to be, until this very day). In 1960 candy production was moved to our first Candy House and over time there were 3 expansions to the original building with a new kitchen, warehouse and munch coating area. Other milk chocolate creations were developed – almond squares, and pops. We then expanded by adding dark chocolate in 2004 to our candy repertoire. At the same time we realized the need to streamline our product line, and concentrated on munch, discontinuing caramels. Over the course of time our business expanded with candy mail orders being supplemented by an on-line candy store, Trappistinecandy.com. 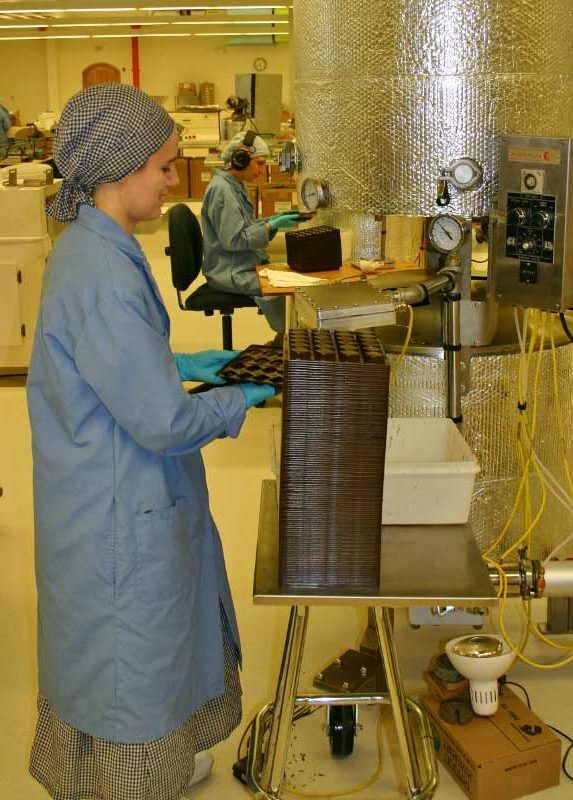 Expansion needs combined with structural limitations of the existing candy making facility provided the impetus to take on the construction of a new candy house. Seven years of planning brought us to groundbreaking March 25, 2010 with completion of the project in the beginning months of 2011. Beginning in May, 2011 we have been making candy in our new Candy House, and we can never be grateful enough for all the help we have received.